Though Attorney General Mukul Rohatgi insisted that contempt charges should be framed against Justice Karnan, the bench was of the view that one more opportunity should be given to him. At the outset Rihatgi said Karnan was bound to appear. Referring to the letter written by Justice Karnan to SC the AG said "it only aggravated the issue as there are many more grave allegations". At this point CJI Khehar asked "who has given the letter. How is it in public domain?" Rohatgi said it was being circulated on Whatsapp. AG said instant action was required and it also be seen that court also acts against its own. CJI slammed Advocate Mathew Nedumpara who tried to argue that Justice karnan "needed a patient hearing and compassion". Warning that nobody would be allowed as intervenors the CJI said those " who try to disrupt the case in future shall understand that we can proceed against them in consonance with law"
" Notice against Sri Justice Karnan has been duely served.A communication has been received from him which was made to Secretary General. Despite due notice, Justice Karnan has not entered appearance. No one has been authorised by him to represent him today. We are not aware of the reason for his non-appearance. So we are not proceeding with the matter further today.Post it after three weeks. 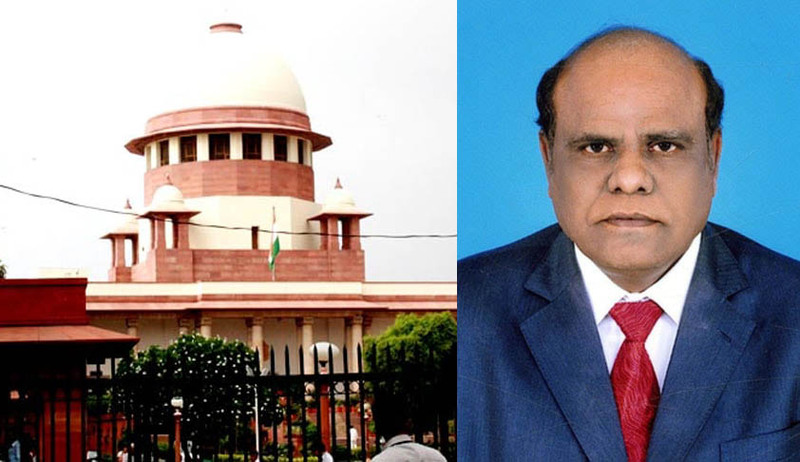 It may be taken up on March 10"
Referring to the February 8 order that also stripped him of judicial and administrative work, Karnan said: “The characteristic of this order clearly shows that the upper caste judges are taking law into their hands and misusing their judicial power by operating the same against a SCST judge (Dalit) with mala fide intention to get rid of him."